The Pz.Kpfw. II Luchs is a German tier 4 light tank. Comparado con el Pz.Kpfw. II Ausf C, el vehículo poseía casco y torreta nuevos, así como un chasis con la colocación escalonada de las ruedas motrices. El carro de reconocimiento poseía características muy buenas, pero solo se fabricaron 131 vehículos de la modificación L, tras comprobarse que la fabricación era muy cara. 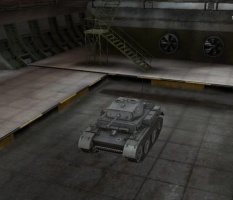 The first of five dedicated scouting tanks in the German tech tree, the Luchs is a fast and nimble tank. If equipped with the 3cm auto-cannon, it can decimate most tier 3s and some tier 4s with one clip and it will hurt many tier V's, VI's and VII's as it has decent damage for an auto-cannon and outstanding penetration (95mm with the AP on the 3 cm Mk 103) for tier 4. The Pz.Kpfw. II Luchs leads to the VK 16.02 Leopard. Often targeted as an easy kill when spotted. As a stock tank, the Luchs has maneuverability similar to the Leichttraktor, and guns that are usually inadequate against the tanks it meets. Once upgraded, the Luchs gains incredibly high acceleration, the ability to turn on a dime often causing it drift when turning at high speeds. 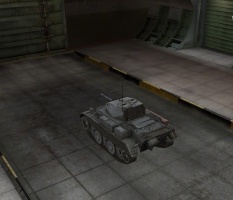 Compared to other Tier 4 Scout tanks, the Luchs has access to a very unique gun known in-game as the "3cm M.K. 103" which is an auto-cannon that has high penetration that averages 95mm and fires 2 shots per burst and has 5 bursts in the magazine (4 in the stock turret). 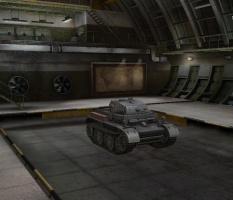 The weapon is designed similarly to the French light tank style of play: "Hit and run". Charge in and unload your magazine into an enemy tank and get away quickly as you reload your gun. However the main problem is the agonizing long reload of the gun taking roughly 16-19 seconds to reload. This is why the gun is somewhat unfit to hunt multiple artillery as the long reloads can slow down the destruction of the enemy artillery. Its general inaccuracy at over 300 meters and high gun dispersion when firing makes it strictly a short to point blank range weapon. The other option is to equip the "5cm KwK39 L/60" which is fast firing and accurate cannon but with average penetration that averages 67mm which makes it solely effective with taking on enemy scouts, some tank destroyers and enemy artillery. The Luchs would almost be the perfect tier 4 scout, if it wasn't held back by a poor top radio, the FUG Spr. 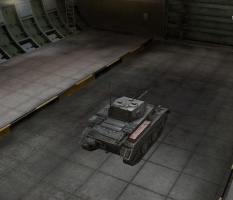 1 with up to 455 meters range which is below average for a scout tank. However if your allies have large radio ranges, you should be fine. With the 9.1 MM changes, the Luchs is very capable scout that often gets to be a deadly combat light when in Battle Tier 4 and 5 matches. The FuG 7 and FuG Spr. 1 radios carry over from the Pz.Kpfw. I Ausf. C and Pz.Kpfw. II Ausf. G, as does the 2 cm Flak 38 L/112 and the 3cm M.K. 103 auto-cannon. Install the FuG 7 and 3cm M.K. 103 immediately. Research the Maybach HL 66 P and the Maybach HL 90. The final development of Panzerkampfwagen II was the Panzerspaehwagen II Ausf L Luchs (Lynx) - Sd.Kfz.123 (VK 1303). This light reconnaissance tank was produced by MAN and Henschel (in small numbers) from September 1943 to January 1944. An order for 800 was made, but only 104 (some sources state 134) were manufactured (chassis number 200101-200200). MAN developed the chassis and Daimler-Benz the superstructure and turret. The Luchs was a development of the VK 901 (Ausf G) and used its modified suspension and hull. It was powered by the 180hp 6-cylinder Maybach HL66P engine withf ZF Aphon SSG48 gearbox. 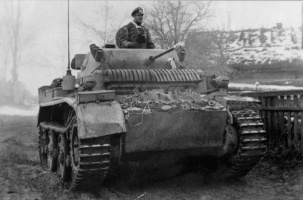 The Luchs weighed 13 tons and had a road range of 290km. The four-man crew consisted of a commander, gunner, driver, and radio-operator. Communication equipment consisted of the FuG12 MW receiver and 80-watt transmitter. The communication between the crew was by the use of intercom. This light reconnaissance tank saw service until the end of the war on both the Eastern and Western Front with Panzer-Aufklärungs-Abteilungen (armored reconnaissance detachments) of Wehrmacht and Waffen-SS. Reported users include the 116th Panzer Division on the Western Front, and the 3rd, 4th, and 6th Panzer Division on the Eastern Front. It is reported that both the 3rd SS Panzer Division Totenkopf and 5th SS Panzer Division Wiking on the Eastern Front also used the Luchs. Vehicles sent to the Eastern Front were mounted with additional frontal armor plates for increased protection. Small numbers was fitted with additional radio equipment and antennas, serving as reconnaissance communication vehicles. The Luchs was to be eventually armed with the (Luchs 5 cm) 50mm KwK 39 L/60 gun (VK 1602 Leopard), but only variants with 20mm KwK 38 L/55 cannon were produced. The 20mm cannon was fitted with a TZF6 optical sight, and had a rate of fire of 420 to 480 rounds per minute. 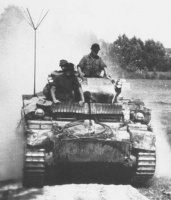 It is also reported, but not confirmed, that 31 Luchs were mounted with an open-top turret armed with the 50mm KwK 39 L/60 gun and began equipping troops in late 1943. 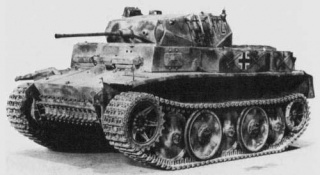 Also, plans were made to produce a recovery version, the Bergepanzer Luchs, but they never materialized. Along with Bergepanzer Luchs, a scale model of the Flakpanzer Luchs anti-aircraft tank based on a lengthened chassis (VK 1305) and armed with either the 20mm Flakvierling or 37mm Flak 36 gun was made, but this project was never realized. The 2cm Flak 38 and 3 cm M.K. 103 configurations are fictitious. Neither guns were ever equipped on the Luchs.